For any questions or problems with the game, please leave a comment here. We will response as soon as possible. Thanks! Version 2 keeps logging me out in on-line mode. Never happens with Version 1. 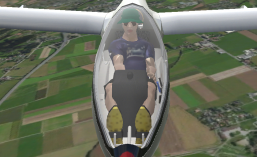 I have just bought Xtreme soaring 3D II. I follow your video inatructions but on take off the tow releases always automatically between 600 -1200 ft agl. Hi, I recently purchased the full version, because I enjoyed the game quite a lot. But after one or two flights the rudder locks in an extreme position (left or right). Soon the screen turns black except for the inscreen buttons and text. Reinstalling did not help. Are you aware of the problem? What can I do? Ty! Try lowering yaw sensitivity. And join:xtremesoaring.freeforums.org for more adventures, challenges and fun. Max I’m not customer service. To to : xtremesoaring.freeforums.org for more help and iddas.There won’t be any updates. We’re lucky to have this much. Can android and iOS play together? On v1 yes. Many Europeans there.